Who is the man behind Block & Cleaver? BURNETT COUNTY -- Don’t let Wisconsin’s winter freeze keep you inside, now that the summer crowds have subsided it is a perfect time to venture out for a visit to Block & Cleaver Artisan Meats. The facility employing fifteen full-time employees is just to the west of Siren on Highway 70, one block south on Nyberg Road. The retail entrance is on the west side of the building. After a warm welcome at the door, your senses will thank you with the tantalizing smell of smoked meats, and eye-catching cases filled with their own specialty smoked products. If your lucky your taste buds will even get to sample one of their 11 bacon variety of flavors, 12+ snack sticks, 6+ jerky options or summer sausage flavors. Block & Cleaver also carries a variety of other specialty meats fron traditional bratwurst, breakfast sausage, skin-on beef hot dogs to unique meats including farmers blends (beef, pork, bacon ends), apple cider bacon and bleu cheese/black olive braunschweiger. All of their products are created in the onsite production facility from traditional artisan recipes that assures great flavor and quality. Who is the man behind Block & Cleaver? His name is Adrian Dykstra who has taken a circuitous route to his home now in Siren. 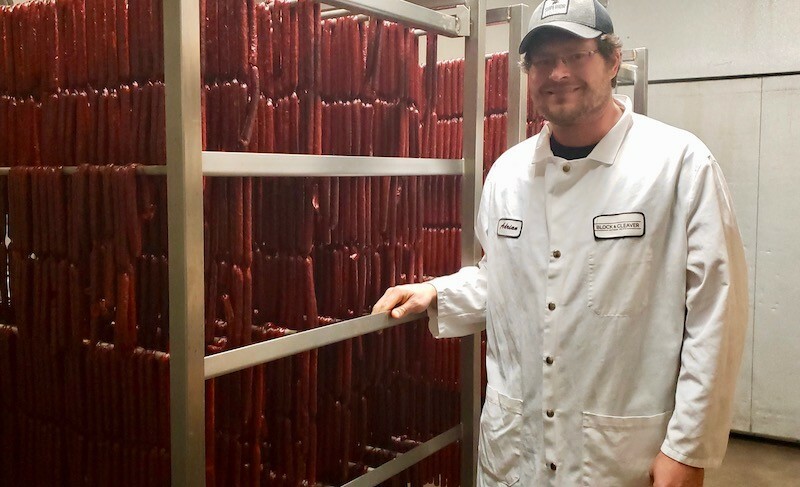 Originally from Omaha NE, over the past decade, he’s made stops at the University of Minnesota, Chicago as a CPA in big four public accounting firm and then back to Minnesota where he started to build his roots in the artisan meat industry. “I have always thought about going into the manufacturing of consumable goods,” he says. Lucky for us he did just that in 2016 with Block & Cleaver. From day one, their focus has been on the craftsmanship of a quality product. Staying true to this focus has resulted in both a thriving community retail business and a larger regional and even national presence with wholesale and private label products sold in over one hundred locations. Over the past two years, the Block & Cleaver branded products have expanded and can be found from the Twin Cities, through western Wisconsin, up to Duluth. Balancing the requirements of a local butcher and a regional/national wholesaler is not always easy but Block & Cleaver loves the opportunity and challenge. In order to best serve their hometown, the products are artisanally crafted and offer the traditional beef, pork and lamb cuts as well all the unique specialty items including a pork “Coppa” steak, beef oxtail, hang tenders, skirt steaks and even heart, tongue and liver. 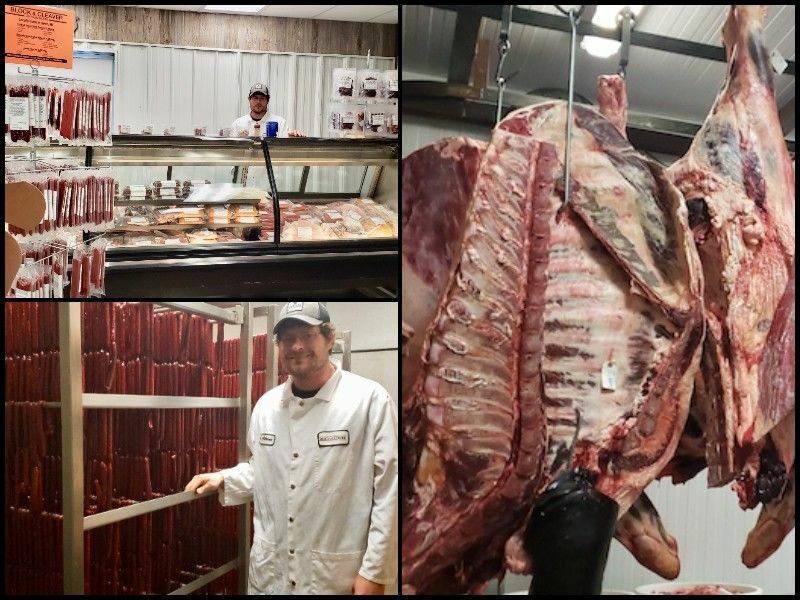 Being located in the Northwoods and being an avid outdoorsman himself Adrian also made the decision to add on a variety of wild game processing options in the past year, from whole carcass processing to specialty wild game sausages and smoked meats. So what’s next for the local butcher shop? Block & Cleaver has expansion in mind. Some initiatives Adrian has outlined for the next year are online ordering and nearly doubling the retail space to accommodate more products including an expanding seafood selection that already has the best and biggest king crab legs in the Northwoods. If you’re hungry for more information or want to check out their latest promotion look them up on Facebook https://www.facebook.com/blockandcleaver/, website - blockandcleaver.com or give them a call at 715-349-7282 or stop in and try a sample at their retail location at 7991 1st Street Siren, WI 54872. Official winter hours are Thursday - 9AM - 5PM, Friday - 9AM - 7PM, Saturday & Sunday - 9AM - 3PM. After visiting, customers are hooked on making Block & Cleaver a routine stop and keeping the grill warm no matter the season.